Track which students attend your programming and services and for how long, by having them sign in and out via QR code scanning. Identify students who are not engaging in campus activities and help them participate in future events. Discover which services are a hit with your students, and which ones might need some work. Track your students’ progress and send them targeted push-notification reminders when it’s time for them to meet back with their advisor. Forget about surveys that go unanswered, or are asked too late to return any actionable results. Find out what your students think of events and services through a 5-star ranking system, or ask them a question immediately after they’ve checked out, for the most accurate feedback. Track which students are engaging with campus life, and which are not. 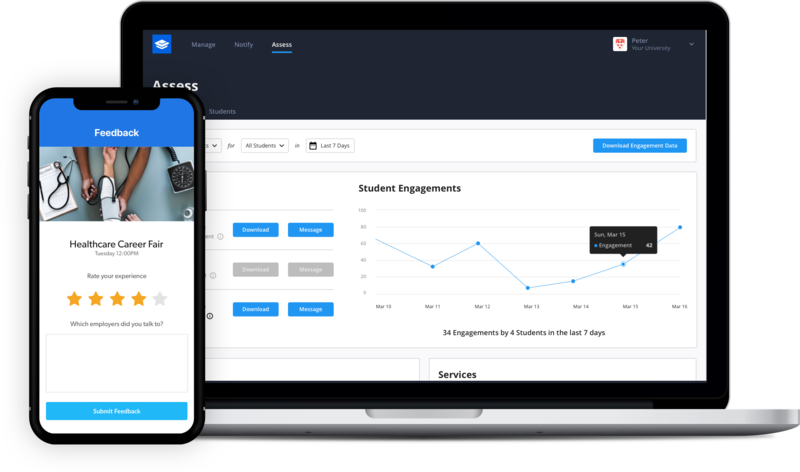 See all participation data collected within your campus app clearly on your desktop, identify insights and take appropriate action with at-risk students.